Petition successful — Council repeals approvals — Court challenge settled? In a ruling filed on May 26, 2017, the Honorable Geoffrey Glass, the judge handling the OCMA litigation, denied LITS’ request to have OCMA’s legal challenges to the referendum petition dismissed as a “SLAPP” suit. Judge Glass felt that LITS was not the proper party to be bringing an anti-SLAPP motion, but even if they had been, he thought compliance with the technical procedural requirements of the Elections Code (which OCMA alleges were violated by the format of the petition) was a “content neutral” issue, and not a constitutionally protected activity against which an anti-SLAPP motion could be brought. LITS appealed Judge Glass’ ruling, which put the entire litigation on hold until the appeal could be heard and ruled upon, a process likely to take many months. In the meantime, it appears OCMA has found a potential new buyer for their property, and a tentative agreement has been announced under which OCMA would withdraw all their legal challenges regarding both the LITS petition and the City Council’s repeal of its Museum House approvals. See the news stories at the end of this page. As explained below, the Orange County Museum of Art has brought a suit against the City and its residents seeking to invalidate the Museum House referendum petition, and all the Council’s actions based on it, citing alleged technical violations in the petition’s form and content. On his May 22 afternoon docket, the Honorable Geoffrey Glass, the judge in the case, heard an “anti-SLAPP” motion brought by the Line In The Sand PAC seeking to dismiss OCMA’s filings as a meritless “strategic lawsuit against public participation.” Barring appeal, success in this would end OCMA’s case and end all doubts about the validity of the Council’s repeal of the Museum House approvals. Public attendance is welcome and encouraged. The purpose of anti-SLAPP motions is to prevent vengeful suits, brought without any legal chance of success, to punish persons exercising their constitutionally-protected rights of free speech and petition. SPON and LITS feel strongly that OCMA has no chance, in the end, of convincing the judge that the alleged minor technical deficiencies in the petition were enough to justify his invalidating the petition. However, the success of the anti-SLAPP motion hinges on two highly technical questions raised by OCMA: (1) whether LITS is the proper entity to be bringing the motion, and (2) whether challenges to technical deficiencies of petitions are subject to anti-SLAPP motions (there being one previous case suggesting they are not, and another suggesting they are). If the anti-SLAPP motion fails, the litigation will continue, with a hearing at some future date to determine the merits of whether the technical deficiencies of the petition were sufficient to justify its invalidation. In the unlikely event that the petition is invalidated as a result of that later trial, a separate case remains pending. That case contends that the City Charter’s “Greenlight” provision separately requires the Council’s approval of the General Plan Amendment making the Museum House possible, if left standing, to be submitted to the voters before it can become effective — essentially reviving the referendum, but without the need for a petition. The Orange County Superior Court case number for the present case, “Orange County Museum of Art vs. City Council of Newport Beach,” is 30-2017-00896448-CU-PT-CJC. The Central Justice Center is the high-rise courthouse building at 700 Civic Center Drive West, Santa Ana. On January 25, 2017, the Newport Beach City Clerk received word from the Orange County Registrar of Voters that enough signatures had been validated on the Museum House referendum petition to qualify it for action by the City Council. In fact, based on the sample tested by the Registrar, it appears that in less than two weeks the circulators obtained more than twice the required number – representing nearly a quarter of all registered voters in Newport Beach. This is particularly remarkable in view of the campaign of deception and intimidation waged by the developer against the petition. The certification result was presented to the City Council as Item 21 at their February 14, 2017, meeting. As Item 15 on their February 28 agenda, the Council voted 5:2 to begin the process of repealing all their previous Museum House approvals, with the exception of the certification of the EIR, by introducing a proposed ordinance. This is a less costly option legally available to the Council — chosen, presumably, because the result of holding an actual election seemed to them a foregone conclusion. The actual adoption of the repeal ordinance was completed with a second reading as Item 5 on the Council’s March 14 “consent calendar.” The repeals will become effective 30 days thereafter. This is with an understanding that OCMA is contesting the validity of the petition in the Orange County Superior Court. On March 8, the court denied OCMA’s request for an order preventing the Council from taking further action on the petition. Unless the court ultimately finds the petition invalid, the repeals will stand and state election law will bar the Council, for the following year, from considering a General Plan amendment for the OCMA property similar to the defeated Museum Tower proposal. For further details on the status of the Museum House referendum please visit the LITS website at LineInTheSandPAC.com. Project Overview: The Museum House is a proposal for a 25-story, 295 foot tall, 100-unit luxury condo tower to replace the one story Orange County Museum of Art in Newport Center. Why We’re Watching: We feel the project would, in fact, violate both the letter and spirit of Greenlight and are making a case for it to be put to a vote. You can watch the video recording of the April 7 study session which is included in SPON’s Video Library. The Greenlight issue revolves around 79 residential units (out of the 100 allowed without a vote). An earlier City Council, without processing a General Plan amendment, already allowed units above and beyond the voter-approved General Plan limit for Newport Center. However, City staff and the current City Council refuse to accept this, forcing residents to reclaim their right to vote by circulating petitions for a referendum on the Council’s approval. The Notice of Preparation (NOP) was issued in March. The NOP identifies issues that should be addressed in the Environmental Impact Report (EIR). SPON submitted comments on the NOP, which you can read here. A standing-room-only crowd attended an April 7, 2016, Planning Commission Study Session on this proposal. The applicants were present, but spent most of their time explaining why the project is consistent with a plan presented for Fashion Island in the 1960s and does not require a Greenlight vote. Read an extract of Public Comments here. The City Council requested an April 26, 2016, discussion (Agenda Item #14) of the competing applications for new residential development in Newport Center (Museum House and 150 Newport Center). At it, City staff skirted the Greenlight issue, insisting it doesn’t exist. The Draft EIR was released for a 45-day public review period beginning August 17 and ending September 30, 2016. See announcement here. The developer made a presentation at the August 20 meeting of Speak Up Newport (SUN). The SUN meeting video is available on the city’s website as “Residents Speak Up About Museum House”. During that time, the Planning Commission held a second study session on September 1, 2016, which can be reviewed on the SPON video channel. At the study session proponents outnumbered opponents. It might be noted that the proponents see this primarily as a fund-raising opportunity for OCMA, which hopes to build a new museum in Costa Mesa using the profits from the rezoning. Fund-raising, however well intentioned, is not necessarily good planning. The Planning Commission ultimately disposed of the application in a single hearing on October 20, recommending approval without any modifications, and the the City Council did the same on November 29, with only Council member Tony Petros dissenting. Technically, only the General Plan land use change from “Private Institutional” to “Multiple Residential — 100 units” and the Environmental Impact Report were given final approval on November 29, with the remaining items approved on the Consent Calendar at the Council’s largely ceremonial December 13 meeting (prior to the three newly-elected Council members taking their seats). Immediately following the November 29 vote, Line in the Sand, an independent Political Action Committee that supports many of SPON’s objectives, prepared to circulated a referendum petition demanding the Council’s decision be revisited in a citywide public vote. The start of signature gathering was delayed by burdensome conditions gratuitously placed on the petition by the Council, and the actual gathering was vigorously obstructed by the developer. Despite those obstacles, more than twice the required number of signatures was collected in less than two weeks, as detailed above and below. The City Council is expected to receive notice of the adequacy of the petition on February 14, at which meeting they will have to choose between repealing their November 29 approval or placing it on a future ballot for the public to decide. There’s no question that most residents have had ENOUGH. Wouldn’t it be nice if developers stopped wasting their time (and ours) proposing projects that are totally outsized and detrimental to the neighborhoods that surround them? We’re not there yet, and it will be a challenge – but “Our Town” is worth the effort it is taking to get there. SPON and the Line in the Sand Political Action Committee continue to follow the process closely. Please visit the LITS website for further details and a complete timeline of the referendum process. Press Coverage: Your letters and newspaper articles continue to appear in both the Daily Pilot and the Newport Beach Independent. Here’s a slightly out-of-date sampling in case you missed them. For links to more recent coverage, visit the LITS website. 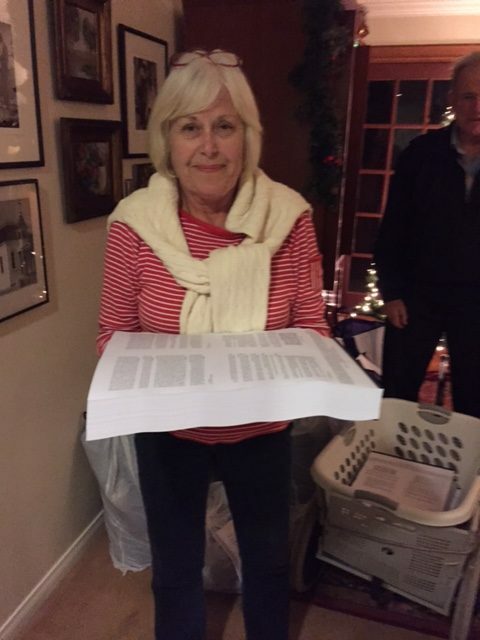 Museum Tower Petition Drive Succeeds a Week Ahead of Schedule – Signatures Being Counted! 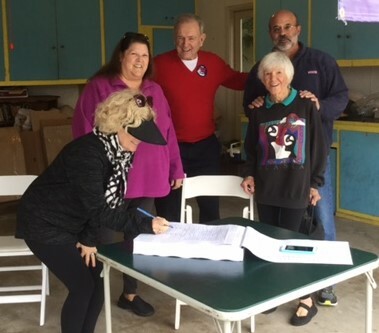 Our understanding is that the Line in the Sand political action committee, through an extraordinary team effort by principals, volunteers and supporters, was able, in less than two weeks, to obtain nearly twice the number of signatures needed for a successful referendum. Having determined their goal had been far exceeded, LITS decided to submit the completed Museum Tower Referendum petition books (constituting nearly two tons of paper!) to the City’s Elections Official (the City Clerk) this morning, December 21 — a full week earlier than legally required. It is now up to the City to verify that the requisite number of signatures was indeed obtained. They have about six weeks for that, after which the City Council will be required to either withdraw their approval of the land use change, or put it to a citywide public vote. For further details, photos and video of the petition delivery, and still more information about what’s next for the Museum House — all soon to be posted — visit the LITS website at LineInTheSandPAC.com. Although IRS constraints prevented SPON for participating directly in the later phases of the petition effort, SPON commends this remarkable outpouring of volunteerism, and this exceptional demonstration of the tremendous interest the public in general has in the quality of life in Newport Beach. Important update: the start of signature gathering for the Museum House Tower referendum was delayed by a City Council action on November 29 adding thousands of pages of documentation to the paper petitions on which the signatures have to be affixed to legally request a citywide vote on the Council’s controversial decision– thereby significantly shortening the already very short time in which signatures have to be collected. Meanwhile forces aligned with developer have been engaging in a number of questionable practices intended to confuse and distract potential signers. The true 10-pound paper petitions that need to be signed by the end of the year just began becoming available from the printer on Wednesday, December 7, and initial supplies are limited. Please visit the Line in the Sand PAC website for the most current information on where and how to sign this important petition. Every signature counts! Over this last weekend, the Museum House developer (Related California) and its affiliate (OCMA Urban Housing LLC) have employed a myriad of tactics to create confusion and false information about the referendum and signature-gathering process. For those of you who intend to support the Referendum, please remember this: We must all stay focused on the goal of collecting the required number of validated signatures to qualify the Referendum for a vote. Line in the Sand PAC has just three weeks to do this, and these opposition tactics divert our time and attention from our goal. Our LITS volunteers and supporters are razor-focused on the goal of collecting 8,000 signatures for validation by the Registrar of Voters before the end of December. We ask that you stay focused too. For more information about the Referendum, including dates, times and locations where you can go to sign the petitions, please visit LineInTheSandPAC.com . Important update: the start of signature gathering for the Museum House referendum has been delayed by a City Council action on November 29 adding thousands of pages of documentation to the paper petitions on which the signatures have to be affixed to legally request a citywide vote on the Council’s controversial decision– thereby significantly shortening the already very short time in which signatures have to be collected. Meanwhile forces aligned with developer have been engaging in a number of questionable practices intended to confuse and distract potential signers. Please be patient. The true paper petitions that need to be signed by the end of the year are expected to begin becoming available from the printer on Wednesday, December 7. However, initial supplies may be limited. Many thanks to all who signed the previous joint SPON/LITS online petition opposing Related Companies’ proposal for the Museum House Tower, a 100 unit, 25-story, 295 foot tall high density condo tower that would replace the current low-rise Orange County Museum of Art galleries at 850 San Clemente Drive in the northwestern part of the Newport Center / Fashion Island area. A recap of the petition results and comments as presented to the City Council at their special November 29th meeting can be viewed on the City’s website here. Despite that outstanding effort, the City Council voted 6 to 1 (with Councilman Tony Petros opposed) to change the land use designation of the OCMA parcel from “Private Institutional” to “Multi-unit Residential – 100 units,” as well as a number of other actions allowing use of that new designation to begin construction of the “Museum House” Tower, contingent upon final approval at the Council’s December 13th meeting. Pursuant to the terms of the Greenlight section of the City Charter, and coming on top of other recent additions to Newport Center, SPON firmly believes this November 29th change to the General Plan should have automatically gone to a citywide vote. However, the City Council disagrees, forcing residents to reclaim their right to vote by referendum. That arduous process requires residents to obtain the signatures of roughly 5,600 Newport Beach registered voters on legally correct paper petitions within the next 30 days. SPON and the Line in the Sand Political Action Committee are in the process of initiating just such a referendum; and it is important to understand these are completely different from any paper or online petitions you may have signed before (as in the recap, above). If successful, the new petitions will force the Council to either repeal their approval of the land use change, or put it on hold until the voters can affirm or reject the approval at a future election. To make this a success, everyone will have to help. Further information on what you can do will follow soon. But please visit LineInTheSandPAC.com for the most accurate and up-to-date details. Thank you all again… the battle has begun! Scoping Session Public Meeting Overview: The Museum House project brought a standing room only crowd to the Newport Beach Civic Center Community Room meeting on February 22. The meeting was a scoping session to elicit comments about what should be studied in the Environmental Impact Report (EIR) for a 100-unit residential tower in Newport Center. Residents from all parts of the City shared their concerns about this plan to build a 26-story Miami-style condo tower right in the middle of Newport Center. It is projected to be 315 feet high, replacing the one-story OC Museum of Art which is moving to Costa Mesa. 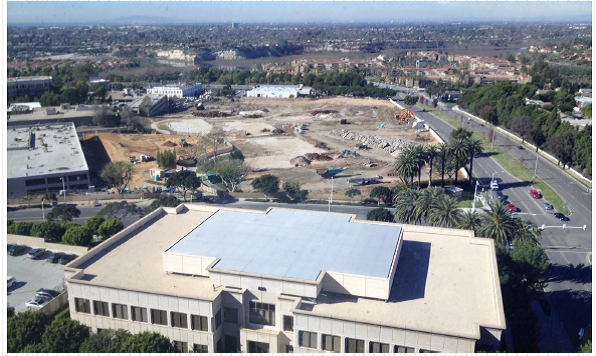 It would be directly behind the sprawling apartment complex The Irvine Company is building at the corner of San Joaquin Hills and Jamboree Roads (made possible with the approval of the 2006 General Plan Update but kept under the radar until after the Measure Y vote). 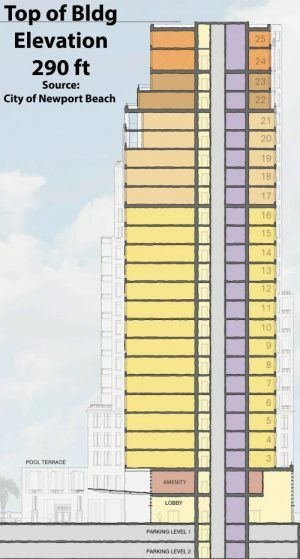 Interestingly, the applicants did not introduce themselves, and only provided vague renderings of what the ground floors of the tower might look like. Comments by participants covered a wide range of issues, from water/energy and public services to aesthetics including views and skylines, noise pollution, traffic and precedent-setting for increasing density and heights. There were interesting points about unlivable parking situations with existing apartment/condo complexes in Newport Beach and of the possible dangers a tower that size could face from earthquakes and stray JWA departures. Our Next Steps: The public comment period for the Notice of Preparation (NOP) closed on March 7, 2016. SPON submitted comments on the NOP, which you can read here. The NOP identifies issues that should be addressed in the Environmental Impact Report (EIR) . . . which will have a public comment period as well. It is important to ensure that the EIR is inclusive of all issues, which is why the NOP is so important. We encourage everyone to share their concerns about the impact this project would have on our community. Once the EIR is ready, the public will have 45 days to comment on it. So please check back here starting early Spring. April 7 Planning Commission Meeting: At this time, a preliminary review of the Museum House Project, along with a holistic review of Newport Center development proposals, is being planned for the April 7 Planning Commission Meeting at 6:30 pm in the Civic Center Council Chambers. Let’s make this another Standing Room Only community meeting. Watch our website for more details as we get closer to this date. Review the Initial Study here. Press Coverage: Letters and newspaper articles have appeared in both the Daily Pilot and the Newport Beach Independent. Here’s a recent sampling in case you missed them. This entry was posted in News, Watch List and tagged development, high-rise, Musuem House, newport center, OC Museum of Art on March 15, 2017 by SPON-Karen.